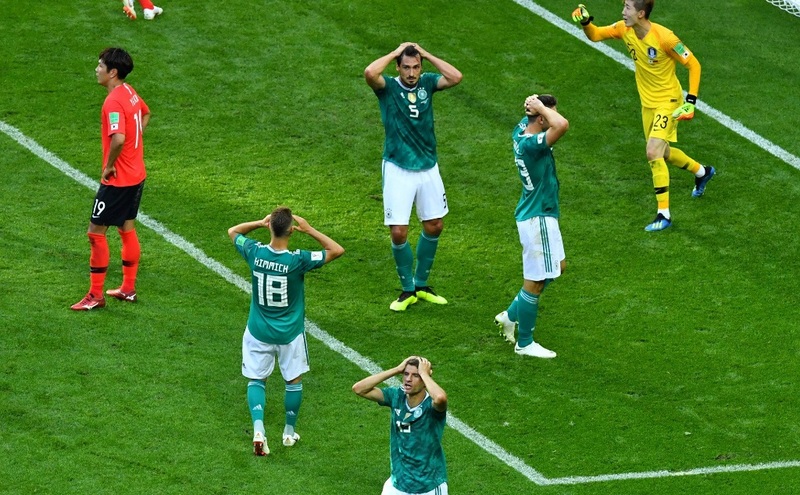 Shock at the World Cup this afternoon in Russia as reigning champion Germany was knocked out of the tournament after a 2-0 defeat to South Korea. To show you the significance of events, it is the first time since 1938 that Germany has not advanced to the knock-out stages of the tournament, as trainer Joachim Low’s team finished bottom of the group. Germany had ended the first half 0-0 against the South Koreans whilst Sweden (in the other group match) was up 1-0 against Mexico at that moment already. The Germans knew that as from that moment they would need a win to advance in the tournament as now both the Swedes and the Mexicans had 6 points and they only had three (from a win against Sweden last Saturday). But as the clock advanced, the German trainer started making substitutions, entering more attackers and taking out defenders, leaving his defense wide open. Sweden meanwhile went up 3-0 against Mexico. The Germans pushed the whole of the second half but were unable to score, finding an unstoppable South Korean goalkeeper in their path. Then in the 90th minute, the unthinkable happened as South Korea managed to score a goal. It even became worse as in the 95th minute the Asian team doubled their lead. In the end, Sweden finishes the group on top, advancing to the next round together with Mexico as Germany and South Korea are out. As long as mexihole loses from here on out, I’m good!